So very glad spring has finally arrived and the Red Robins are out in all their glory. 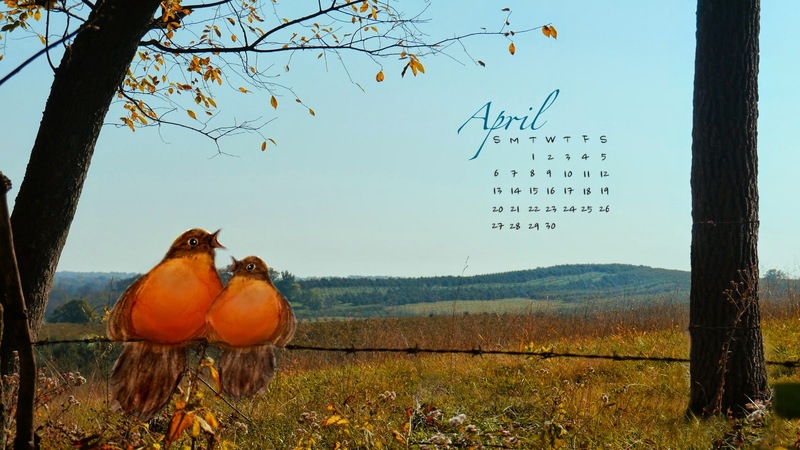 My April 2014 Downloadable Desktop Calendar features one of my watercolor paintings of a pair of happily singing Robins, with a lovely view of local Orr's Orchard from the top of the trail at Poorhouse Farm Park. Your paintings are just gorgeous! I am off to check out some of those bunny paintings in your shop right now!! Happy week to you!! Your desktop calendar for April is adorable. Your paintings are gorgeous! I saw my first robin over the weekend. I'm so ready for spring. I have to head out to work, but I will be back to visit. Thank you for the calendar....love the painting! You are so lucky to be heading into Spring. Yesterday while visiting my daughter we saw our first Robin, poor thing looks so hungry. It is terrible as we have 5 feet of snow yet and the Robbins have returned and they can't get any food. Love your calendar, great idea. Hi Cynthia, what a great blog! Your paintings are just lovely, and your desktop calendar is such a great idea. Thanks for finding your way to my blog, Happy Easter!